This is a companion article to “Gluten-Free Success.” I started out writing Gluten-Free Success, but a quote from Vishwas Chavan sent me down a rabbit hole. That trip resulted in this article. Thanks for riding along. Head spinning - heart pounding - thoughts racing - brain melting. While these may be symptoms of gluten intolerance, I was describing what many feel when faced with change. Changes in lifestyle can be some of the biggest modifications we experience particularly if we have a gluten-related disorder. Transitioning to a gluten-free lifestyle turn our lives upside down. So keep calm and let's get prepared. We're going to delve into the gluten-full to gluten-free metamorphosis. I want to give you a basic understanding of change and the knowledge to make it a successful transition. Humans have been changing since our existence; however, that doesn't mean we always like it or find it easy to do. Why? Our brains try very hard to maintain stability. Our brains are all about survival; they want to minimize threat and maximize reward. They want to predict what will happen to steer clear of danger. BRAIN: "What's that noise? Why are those bushes rustling? Is it a wild animal getting ready to attack us? DANGER!" When confronted with change, our brain can't predict the outcome, so it triggers the"flight or fight" response. Faced with uncertainty, we find ourselves distracted, anxious, and fearful. This heightened state decreases decision-making abilities, reduces memory, and elevates anger; not always conducive for clear, thoughtful consideration. The human brain is an astounding organ. Not only does it need to maintain order, but it also manages adaptation. We may not notice it, but our brains are continually changing in response to our ever-changing environment; the scientific name for this process is neuroplasticity. This adaptability enables our species to thrive and survive all kinds of adversities. The trick is to use our innate adaptability to our advantage. However, this metamorphosis requires a lot of effort. 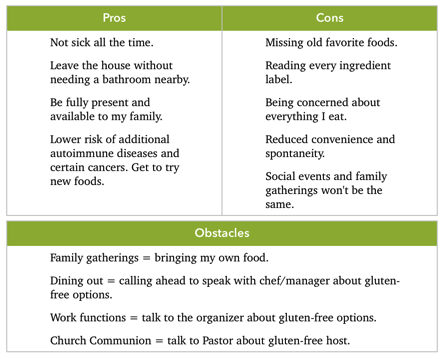 When transitioning into the gluten-free lifestyle, there are a lot of changes, unknowns, and unpredictable outcomes. Yes, our brains are going to freak-out. We are replacing old comfortable habits and behaviors with new, unfamiliar ones. Those old behaviors have become almost automatic; requiring little to no thinking. We have had a lifetime to build those neural pathways in our brains. Neural pathwhats? The pathways along which information travels through the nerve cells of the brain. When we say or do things repeatedly, that information in our brain travels the same path. Think about a hiking trail in the woods - as the path receives more traffic, it becomes better defined, well worn and effort-less to travel - the same thing happens in our brains. When we start our gluten-free lives, we are blazing new pathways. This requires us to be conscious, and purposeful in our efforts. 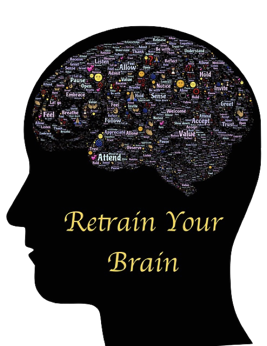 Over the years, scientists and mental health care professionals have developed many thoughts and theories about the brain, the process of change, and human behavior. Of the many behavioral change models that exist, the most prevalent are Learning Theories, Social Cognitive Theory, Theories of Reasoned Action and Planned Behaviour, Transtheoretical Model of Behavior Change, The Health Action Process Approach and the BJ Fogg Model of Behavior Change. Each model has its own set of strengths and weaknesses. That's not something we'll be discussing here. 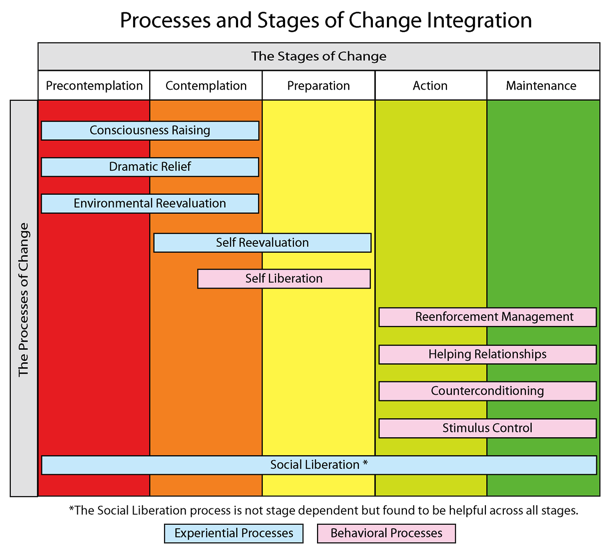 We will be exploring the Transtheoretical Model of Behavior Change (TTM) - also known as The Stages of Change. I chose this method because it made sense to me, it seemed logical and fit my personality and way of thinking. Will it be a fit for you? I don't know the answer, but keep reading you might be surprised. 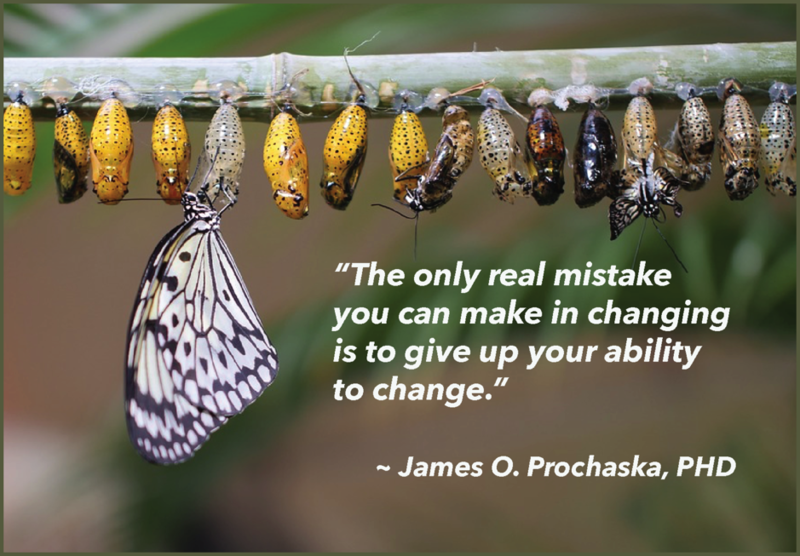 According to Prochaska's collaborator and wife, Janice M. Prochaska, Ph.D., who serves as CEO of Pro-Change Behavior Systems. "This model works with the whole at-risk population, not just those who are ready for change right then." She also estimates that only about 20 percent of people needing a health-based behavior change are prepared and ready to make the change. While this model was initially applied to smokers, its versatility permits it to be implemented in a variety of situations. We'll be exploring how it might work for transitioning to a gluten-free lifestyle. There are four components to TTM. The Stages of Change - when change occurs. Pre-Contemplation: No action for six months. Contemplation: Intention to act within six months. Action: Experiencing change for less than six months. Maintenance: Experiencing change for more than six months. Decisional Balance (Pros & Cons) - why we change. Weigh the Pros (advantages) and Cons (disadvantages) of changing. Pros and Cons are independent of one another. Can be high in one - low in another. High in both, or low in both. Pros begin to outweigh the Cons before we take action. The key: double-up the focus on increasing the Pros of changing. Self-efficacy (Confidence & Temptation) - confidence to execute change. Confidence is low and tends to grow as we progress through the stages. Inversely, temptation lessens. Confidence and Temptation tend to be balanced during the Action stage. The Processes of Change - how change occurs. Describes the basic pattern of activity we experience as we process change. The Prochaska and Di Clemente suggest that we move through six stages of change: pre-contemplation, contemplation, preparation, action, maintenance, and termination/adoption. While not part of the original stages, we'll also examine the relapse stage. Movement between stages is not always a straight line. It's normal to cycle and recycle through them, but we can never be in two stages at once. If we get lost along the way, we figure out what stage we're in and go from there. In this stage we do not know we have to change, or we do know, but simply do not want to. When it comes to the effects of gluten, there's a wide spectrum. [This stage casts a wide net over the gluten-free community.] In most cases, people with gluten-related disorders have experienced some ill-health - be it long-term or short-term. We know something is wrong, but haven't been diagnosed or have been misdiagnosed. Maybe we think our state of being is perfectly normal because we've always been that way - our entire family is that way. If we have silent celiac disease [have no symptoms], a diagnosis will catch us completely by surprise. We may have a diagnosed family member urging us to get tested, but we brush them off like a pesky mosquito. In this stage, we don't want to hear that gluten could be a problem for us. "Give up my bread/pizza/beer? No way, I'd die without it." "Just because you have problems with gluten, doesn't mean that I do." "Bah, my sensitive stomach has nothing to do with gluten." If that sounds like denial, yes, it probably is. To move past this stage, we must somehow become aware that a problem exists and accept that we must address it. We may come to this realization on our own after we've been given testing results from our healthcare professional, or we finally listen to our family and friends. The mere fact that we are "thinking about it" is forward progress! This stage finds us realizing the value in making the change; the mental gears have been turning, and we are getting ready. We have thoughts of "Yeah, I get that gluten-free is important" but the key is to personalize them by thinking "I need to be gluten-free." Here we start to acknowledge the problem and take ownership. Our minds are now open to new ideas and information. We may begin asking questions of friends and family who have already gone gluten-free. The trick is discovering the trigger - the event, the person, the emotion, the reason we flip the switch. We begin to explore the possibilities about what we need to do and if it will be worth the effort. These thoughts can be fleeting or last a lifetime. The bottleneck in contemplation is getting stuck in a loop of weighing the benefits against the costs of making the change. We never feel ready to commit. Deep down we know change is needed, but we can't make it happen. To help organize and visualize our thoughts, sit down with a pencil and paper - list all the pros on one side and the cons on the other. When we encounter obstacles, identify ways to overcome them. With everything that's going on, our emotions may inspire us to act immediately. Sometimes this causes us to jump right into the Action stage - bypassing one of the most important stages - Preparation. Action without perparation can lead to disaster. We've made the decision to change, now we must figure out how to do it. SELF: "What do I need to do to prepare myself to make this transformation happen?" Any successful outcome begins with forethought and planning. We are creating a plan of action; a road-map if you will. Put it in writing, draw pictures with circles and arrows, create a wall-sized vision board, save the plan as your device's wallpaper or desktop picture as a constant reminder - do whatever generates the greatest impact. Begin gathering the tools and resources to help us navigate our gluten-free journey. One of the most effective resources is a local support group; seek out your nearest group - inquire about their meetings (when, where, how often, etc.) - better yet, join and attend a meeting. Start building a library of trusted books and websites. This stage is about building our knowledge and confidence, preparing us for gluten-free success. Think about all the possible ways we cross paths with gluten. Cupboards, pantries, refrigerators, freezers, silverware drawers, cutting boards, toasters, kitchen utensils, counters, medication, hair and personal care products, family gatherings, parties, social functions, restaurants, medical and dental procedures - the list is staggering. All of these things and more need our attention. It's better to have a plan of action so we can be PROactive instead of REactive. Some of our very first actions begin appearing. The key to mastering this stage is a commitment to all the effort, planning, and researching. We must be ready to go all-in. Being "sort of " gluten-free is like being "a little"pregnant. It's game day! We move from thinking and planning to doing. We've done the risk/benefit analysis and committed to making the leap - we've made a plan, and now it's time to act! It's here where real change starts happening. We go on a gluten-round up at home - seeking out and removing all sources of gluten. If we can't do a 100% GF house, we gather and store all the gluten in designated areas. Clean the fridge and stove, get a new toaster, cutting boards, and colanders. Join and actively participate in the local support group [if you haven't done so already]; we truly need that face-to-face support. Read the mountain of gluten-free books sitting on the coffee table. By following our initial action plan, we'll be making significant modifications to our routines, environments, our relationships, and of course ourselves. That's the whole idea, right? As expected, this stage will require every ounce of commitment we can muster. We may find ourselves being pushed and pulled to the very limits. Sadly, some of this stress may come from those closest to us. We need to hold fast to the course we've plotted out; for our own health and wellbeing. If we find ourselves drifting or blown off-course refer back to the plan of action we created. Keep finding acceptable alternatives and focusing on our "cans" instead of "can not's"
It's necessary to acknowledge and celebrate the progress and victories along the way - no matter how seemingly insignificant we think they are. Anything that moves us forward toward our goal is a success! We also need to recognize the failures, not to chastise ourselves, but to learn from them. If we know why something happened, we can prevent it from happening in the future. The maintenance stage is about sustaining the momentum we started in the beginning. 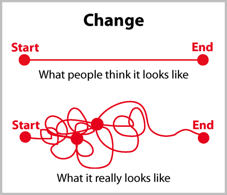 At first glance, we think the hardest part of the change process is the initial startup. True it's tough, but maintaining the change long-term is the most challenging part of the process; it's also the most important. At this point, our new lifestyle is on its way to being established, things are starting to become routine. Confidence is increasing. Certain memories of our past lives are starting to fade. Complacency is our enemy because of the possibility of slipping into our old lifestyle may be lurking in the background. Dramatic life events such as a job change, breakdown of a relationship, a death make us vulnerable. These events can beckon us back into our old habits. While our original plan serves us well, we keep optimizing it to address past mistakes and handle any situations we didn't expect at the start. View these challenges as an opportunity to advance your skills, knowledge, and confidence. This continued growth pushes us ever closer to the next stage. Perhaps more work on label reading is needed because small amounts of gluten are slipping below our radar despite our diligence. We didn't think about our church's communion hosts containing gluten. Our high school class reunion is coming up, maybe we could volunteer to be on the planning committee to have a voice in food options. Pro tip: Get involved in planning activities. This gives us an opportunity educate and make positive changes from the "inside." Because of our new gluten-free lifestyle, our bodies are adjusting, adapting, and healing - mentally and physically. After gluten reactions subside, we may discover other problematic foods. Of course, this will require additional tweaks to our plan. The diets to obtain optimal health are as unique as our fingerprints. It can take some time resolve additional food sensitivities. As we settle into maintaining our new life, we may struggle with keeping the fire lit; we run the risk of losing the intensity. If we haven't participated in a local support group already, make it a priority. Surrounding ourselves with like-minded individuals can help keep us motivated. Fellow members walk our walk, talk our talk, share the same struggles and joys. We started out telling ourselves "I can't", then "I might", followed by "I will", "I am", "I am still", and now finally "I have". It's been a long road on our way to change. After spending at least two years in the Maintenance stage, we find ourselves sliding into the Termination/Adoption stage. At this point, we don't have to think so hard about what to do; we know what to do. Our daily activities come to us naturally; they become second nature, almost as automatic as breathing. We have confidence in our knowledge and abilities. Sure, we may miss certain aspects of our former life, but the desire to return to that unhealthy and sickly life has dissipated. Our transformation from gluten-full to gluten-free has come to fruition. Our new life has become our "new normal." We started out as a caterpillar and came out the other side as a butterfly. Well done. A proud moment for sure. This does not mean we stop our personal evolution process! No, we keep moving forward. We look for new and more adventurous goals. Now is the time to dream and plan for things we never thought possible in our former life. Perhaps we have a strong desire to share what we've learned to help others. Starting your own support group or volunteering at your current group is an excellent choice. Maybe we participate more in online discussion boards or Facebook groups. Possibly start our own blog or website. There are many ways to boost our gluten-free advocacy to the next level. Maybe your new goals have nothing to do with gluten. Perhaps you want to train for that 5K, 10K, or Half Marathon you've always wanted to do? What about music or voice lessons? Now would be a great time to start that writing project. The possibilities are only limited by your imagination. Prochaska estimates only about 15 to 20 percent of the people make it to this stage. If you find yourself falling back into previous stages, don't panic. Be gentle with yourself. Figure what stage you're in - go back to your game plan, see if it needs a bit of tweaking and renew your commitment to moving forward. Ask for help. Never give up. Not an official stage of Prochaska and Di Clemente's model but some valuable insights can be learned here. Note: Repeated gluten exposure is a serious health risk for those with a gluten-related disorder. There is an important difference between relapse and lapse (also known as a slip). A lapse or slip is a rare, quick and temporary return to the behavior/lifestyle we've been trying to leave behind. Example: while attending a birthday party, we have a piece of gluten birthday cake. A relapse is a complete and total return. Example: we tell ourselves the gluten-free lifestyle is too hard and go back to eating gluten. Gluten is so pervasive in our society, no matter how hard we try, we will likely be faced with a gluten exposure at some point. We must be prepared and know how to deal with the inevitable. For this article, I am defining a relapse/lapse as any gluten exposure - be it blatant cheating or inadvertent/accidental. Over the years, I've crossed paths with far too many people with celiac disease and non-celiac gluten/wheat sensitivity who willingly and knowingly cheat. Of course, they have their "justifications," but in the long-run, they are cheating themselves, and their loved ones. If you're new to the gluten-free lifestyle, I'll be crystal clear - cheating is not an option for those with a gluten-related disorder. Accidental/incidental exposure is different from blatant cheating. Regardless of how or why we consume gluten - the damage is the same; the difference here is the intent. We must be mindful of these mishaps, so we do not continually repeat them. If we peel back the layers, there's probably a fine line between repeated accidental/incidental exposures and cheating. To be caught by surprise the first time is understandable, but if the same situation happens repeatedly - it shouldn’t be - we need to take a closer look at what’s going on. GIG of ECW's "The Risks of Cheating" looks at the complications from repeated gluten exposures. While we may not like visiting this stage, it can be beneficial to our overall success. It's important to view relapses/lapses not as failures, but rather another stage on our way to success. If we believe this set back is a failure, we're at risk of creating a self-fulfilling prophecy - undermining our efforts and making it easier to regress to our glutenous ways. Lapses reinforce our need to be completely gluten-free. Once we start feeling better, we might doubt gluten's role in our poor health. While having that piece of pizza when hanging out friends seemed like a good idea at the time, we are sorely and swiftly reminded why we began this transformation. We learn about resilience and persistence. When we are knocked down, we get back up and keep moving forward. Why? Because we deserve a better life and won't stop until we attain it. Because our friends and family deserve a better "us." Never give up. The stages of change tell us what happens when we experience changes in thinking, emotion, and behavior, but the processes of change show us how the changes come to be. The implementation of these cognitive and behavioral activities are used to advance through the stages successfully. The processes are divided into two sections - Experiential and Behavioral. The experiential processes use increase over time and peaks in the contemplation or preparation stage and decrease in the action and maintenance stages. The behavioral processes are used most in the action and maintenance stages. This makes a lot of sense - first, we change our thinking, then we change our behavior. Family members, medical professionals are telling us about our gluten intolerance and our need to be gluten-free. We start gathering information to get a better understanding of the new behavior required to remove gluten. "I recall information people have given me about gluten and gluten-related disorders." The information we are receiving is concerning to us. We start to feel uncomfortable or possibly frightened. Maybe there's really something to this? "I react emotionally to warnings about gluten and gluten-related disorders. Grandma died from a stomach-related illness, no one really knew what it was. Could it have been celiac disease and she didn't know it? If I don't go gluten-free will the same thing happen to me?" We're realizing our behavior is affecting those around us. The effect may be positive or negative depending on our choice. "I realize that if I continue to eat gluten and remain sick, I won't be able to care for my children. By being gluten-free, I am able to fully participate in life instead of watching it from the sidelines." "I feel so much better when I'm gluten-free both physically and emotionally. I know I must remain so for life. When I cheat, I am disappointed in myself for putting my health and my family at risk." "I find mainstream awareness is making it easier to be gluten-free. Family members who have been gluten-free for years tell me it's much easier to be gluten-free today than it was five or ten years ago." "Whew! I feel more comfortable in my home now that gluten has been removed or sequestered. I'm also learning how to cope with gluten in situations where I don't have complete control [workplace, public venues, etc.]." Having support is crucial to a successful transition. We need trusted individuals who are caring, compassionate, and willing to simply listen. "I have a spouse/friend/family member who is tremendously supportive. Always willing to listen and be my gluten-free champion." "My spouse/family members are horrible. They are unsupportive and at times overtly try to derail my efforts. Thank goodness for friends and my local support group members. They understand - they 'get it' - they keep me sane." Grabbing a snack or something to eat can be one of those "autopilot" type actions. It's easy to snag a bag of chips, a cookie, or candy as we walk past it. Instead of stocking our kitchens with glutenous foods we supply it with healthy, gluten-free alternatives. We must be mindful, in today's gluten-free environment it's easy to swap out processed crappy glutenous foods with processed crappy gluten-free foods. Now is the time to make better choices - fresh fruits, veggies & gluten-free hummus, walnuts, almonds, cashews, hard-boiled eggs, high-quality gluten-free dark chocolate (Endangered Species Chocolate Bars). "I wasn't sure about it at first, but I find myself genuinely liking veggies and hummus as a snack." Reinforcement Management renders consequences based on decisions and actions. While reinforcement can include the use of penalties, rewards tend to yield better results over punishments. A combination of cognitive and behavioral reinforcements, positive self-statements, and external recognition reinforce positive behavior and increase the likelihood of repeated positive behavior. While gluten-free treat food may seem like a reasonable reward option, it's not recommended to use any food as a reward (or punishment). Suggestions: Guilt-free "You Time," massage - mani/pedicure, a movie, museum trip, shopping trip, ballgame. "I really rocked it this week. My skills, knowledge, and confidence are growing. I found a gluten-free labeled food containing barley due to my label reading skills. I alerted the appropriate parties. My family and friends are noticing and praising me. I think I'll purchase that Wusthof Chef's knife, I've been eyeing up." We believe change is needed and commit to making that change. "I can no longer ignore the facts. I have come to realize that I can and must be gluten-free. I know that it will not be easy, but I am ready to make the change for myself and loved ones."